The SPLITMUX-DVI-4RT DVI/VGA Quad Screen Multiviewer allows you to simultaneously display video from four different computers on a single monitor. Additionally, it can switch one of the four attached computers to a shared keyboard and mouse for operation and to four additional USB devices. Quad, Picture in Picture, Full Screen, Dual, Fade Through Black, and Win display modes. Supports video resolution up to 1900x1200. Supports digital/analog DVI and analog VGA. Connect analog and digital sources to the splitter, and display images on a digital or analog monitor. Rotate the screen display at different angles - 0°, 90°, 180° & 270°. Touch Screen support - operate connected computers via USB touch screen monitor. Switch audio independently of video from HDMI sources connected to the DVI-I port. Control the multiviewer through the front panel interface, keyboard/mouse commands, on screen display (OSD), or RS232. Control multiple PCs displayed on a split screen with a single keyboard/mouse - no switching required. Cascade Quad Screen Splitters to display video from up to 16 video sources on one screen. LED indicators on switch show which port is active. Built-in 4-port USB hub - switch devices between connected computers. Compliant with USB 2.0 (high-speed and low/full speed) standards. Connect BNC/RCA composite video devices, such as a security camera. Supports KVM over IP extenders to control the Quad Screen Splitter remotely in quad mode or PiP mode. Hosts Four female DVI-I connectors. Four female USB Type B connectors. Four female 6-pin miniDIN connectors. Supports USB and PS/2 computers. Boots PCs SUNs and MACs simultaneously. 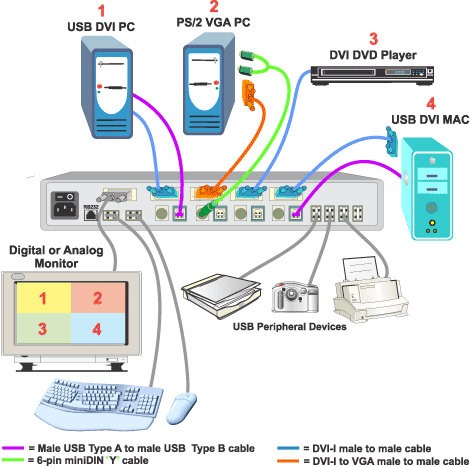 Supports digital DVI devices, such as DVD players, satellite receivers and HDTV tuners. Monitor Supports crisp and clear VGA video resolution up to 1600x1200 and DVI video resolution up to 1900x1200. Devices Two female USB Type A connectors for keyboard and mouse. Supports keyboard layouts in multiple languages: English, German, French, Italian, Spanish, and Japanese. Four female USB Type A connectors for USB peripheral devices (printers, scanners, security cameras, flash drives, etc.). Connect any type of USB device - fully transparent USB connectors. Switch USB 2.0 devices between connected computers. Provides support for high-speed (480 Mbps), full-speed (12 Mbps) or low-speed (1.5 Mbps) USB devices. Cables Four 6.5-foot 6-pin miniDIN Y-cables included. Four 6.5-foot USB male Type A to male Type B cables included. Two 6.5-foot DVI-I male to male cables included. Two 6.5-foot DVI-I to VGA male to male cables included. USB to PS/2 adapter included. DVI-I male to VGA female adapter included. Serial update cable and adapter included.